I am really into healthy muffin recipes these days. They make a great snack and are a healthy breakfast option. Muffins pack easily so they are great for taking to work or school. This particular muffin is a very healthy muffin recipe. It has absolutely no white flour and uses honey for sweetness. See the notes below the recipe for added information about these delicious and healthy muffins. Mix the buttermilk and water in a bowl. Beat in the egg thoroughly. Stir in the wheat germ and let stand for 2 - 3 minutes to absorb moisture, while you prepare the dry ingredients. Mix the whole wheat flour, baking soda and salt on to a square of waxed paper or in another bowl. Add the mix to the wheat germ mixture and mix just until the flour mixture is moistened. Stir in the honey and oil. Spoon into greased or paper-lined muffin cups, filling them no more than 2/3 full. Bake at 400°F for 20 - 25 minutes, until browned and done (a toothpick inserted into the muffin comes out dry). These muffins are fantastic served hot with butter and honey or jam. Or try them with peanut butter and sliced banana. The kids will love them and never realize how healthy they are. Add 1/2 cup of raisins and/or chopped walnuts if you want. 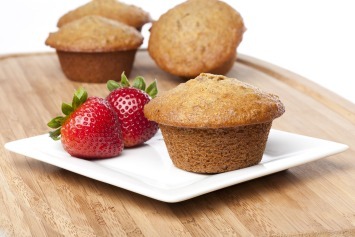 They add great taste and extra nutrients to these delightful wheat germ muffins. Make sure you just mix the wet and dry ingredients together enough to combine them. Don’t overmix the batter or the muffins will not be as tender as they should be. Just combine it enough that there are no clumps of dry mix in the batter. You can make your own buttermilk or soured milk if you don’t have any on hand. Just put 1 tablespoon of lemon juice into a 1 cup measure. Fill the cup with regular milk and wait for 5 minutes for the milk to sour. Buttermilk is perfect for making muffins. It makes the muffins tender. Of course you can use regular milk or a milk substitute like soy milk or almond milk (my favorite), but the buttermilk adds a great texture and flavor. White flour and white sugar are two items you might want to cut from your diet if you are looking to be healthier. Both are on every health professionals “Don’t Eat” list. That is because they have little nutritional value compared with other options and both cause spikes in blood sugar quite quickly. If you need diabetic recipes, this healthy muffin recipe should be of particular interest to you. You will probably still want to cut the amount of honey used in the recipe (depending on how sensitive you are to carbs), but you can see from the nutritional information above that these muffins only have 16.5 grams of carbohydrates each. That’s fairly low for a muffin. These are great muffins to enjoy if you want to increase the nutrients in your diet. Wheat germ is the healthiest part of the wheat kernel. Look here for more healthy muffin recipes.